Audi's curvy exhibition hall for the Frankfurt auto show has an indoor car-testing track. BERLIN -- Audi AG will spend more than 10 million euros ($14.3 million) on an indoor test track at this year's Frankfurt auto show to outshine BMW and Mercedes-Benz as the rivalry among the three biggest luxury carmakers intensifies. Audi, which had previously showcased its models as part of the Volkswagen AG group's display, is investing more than ever to have its own pavilion. The show runs from Sept. 15 to Sept. 25. Daimler AG's Mercedes is also planning a display with a roadway at the show. Both are following BMW, which was the first to have a track to show its cars in action at the biennial Frankfurt event in 2009. "Car shows are the ultimate platform for manufacturers to compete with each other, especially in the luxury sector," Wolfgang Meinig, head of the Bamberg, Germany-based FAW Research Center for Automobile Industry. "Audi is taking this battle to another level. They're breaking away from VW Group presentations to take BMW and Mercedes head on." 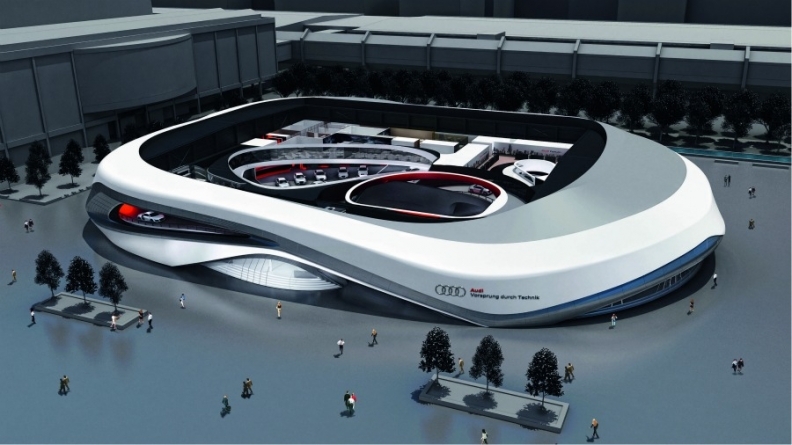 Audi's curvy temporary exhibition hall for Frankfurt measures 100 meters (328 feet) long, 70 meters wide and 12 meters tall. Integrated into the building is a 400-meter-long track that loops into the interior and is partially visible from outside the building. About 30 models will be on display, and visitors can ride in about a dozen vehicles, including racecars, that will circle the hall. Audi, which sold 1.09 million cars last year, has pledged to unseat BMW AG as the world's largest maker of luxury cars by 2015. BMW kicked off the track trend at the last Frankfurt car show in 2009, when it installed a roadway around the inside of its hall. BMW, which previously displayed at the same position that Audi is now taking up, is ready to face the stiffer competition, said Marcel Kranz, BMW's manager of European trade shows and exhibitions. The company typically spends 14 to 16 months preparing for major car shows like the one in Frankfurt. "We see motor shows as the 'pentathlon' of communication, because it's all there: architecture, big-scale billboards, products, motion and movies," said Kranz. "We take on the challenge to keep up" the level of exposure achieved with the 2009 show. Mercedes also wants to make a big impact after being overtaken by Audi as the second-largest maker of luxury vehicles this year. The automaker will have a track outside its exhibition space at the fairgrounds' century-old Festhalle building. The company will allow visitors to test drive electric and fuel cell vehicles themselves, a person familiar with the company's plans said.